Pumpkin Pie Smoothie – all the flavors of a pumpkin pie without having to turn on your oven. Thick and creamy, this dairy free smoothie sure to be a favorite this fall. Fall flavors are the best, don’t you think? The warming spices tend to relax me with just their smell alone. Especially when baking. But, sometimes, I don’t have time to bust out the mixing bowls and turn on the oven. 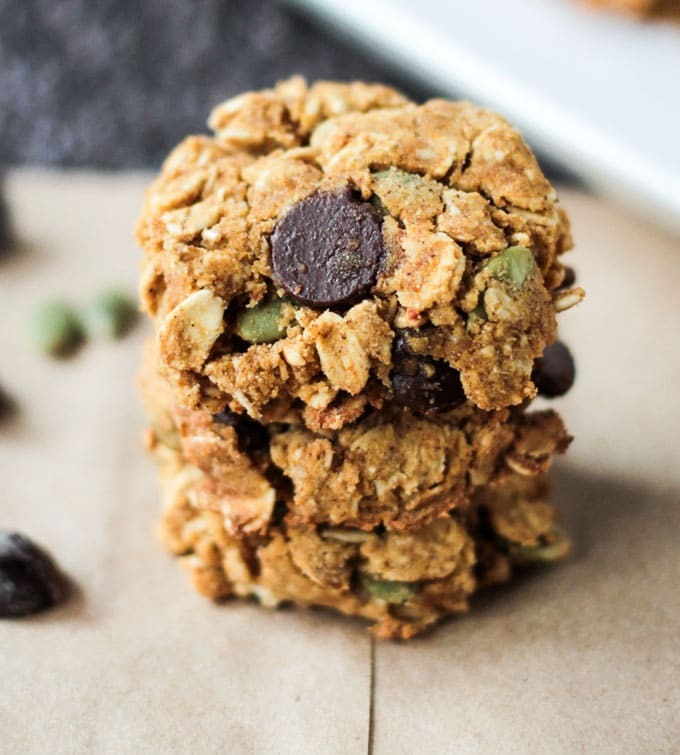 So, what’s a busy girl to do when you want to savor the fall flavors? Put them in a smoothie! 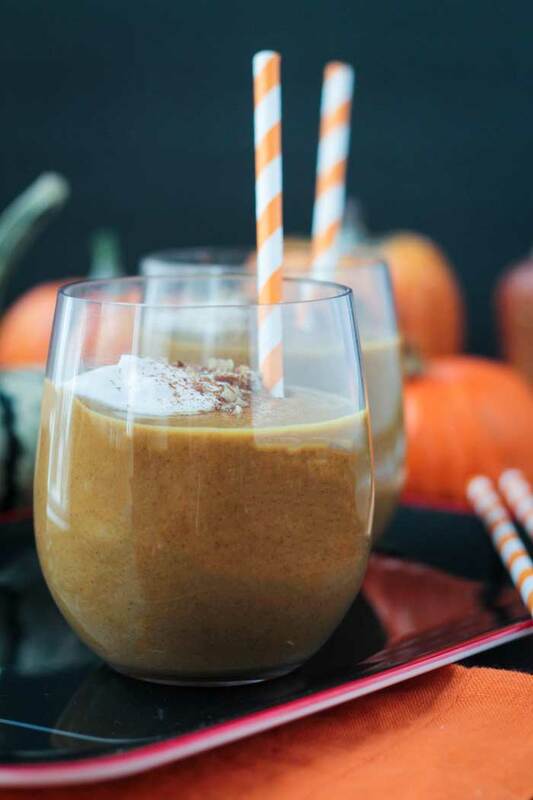 This Pumpkin Pie Smoothie has all the taste of pumpkin pie in quick and easy sippable form. Pumpkin pie might seem like an indulgent, sugary treat, but this smoothie boasts some incredibly healthy ingredients. In addition to the pumpkin, this dairy free fall inspired drink contains potassium rich bananas, protein packed pecans, blood sugar regulating cinnamon, and vitamin E filled almond milk. If you’re craving a quick and easy fall treat, get out that blender and whip up this thick and creamy, dairy free Pumpkin Pie Smoothie. I’d love to hear what you think, so please come back and leave me a comment below with your feedback and star rating once you’ve tried it. You can also find me on social media and I wanna see your remakes! Snap a quick pic and tag me @veggie_inspired and #veggieinspired so I’m sure to see it! A creamy, dairy free smoothie with all the flavors of pumpkin pie. Garnish with coconut cream, if desired. (Refrigerate a can of full fat coconut milk overnight and scoop out the solid part on top). ~This recipe could easily be cut in half. Sold! Such a delicious smoothie. I made this already and it was really good. Thank goodness pumpkin puree is still on the shelves in the stores. So happy to hear you liked it, Ginny! Pumpkin purée should be on the shelves all year round! So versatile! What a wonderful smoothie idea for this season! I will have to try this as I’m a huge fan of pumpkin and pumpkin spice! Yaasss!!! This looks so good! 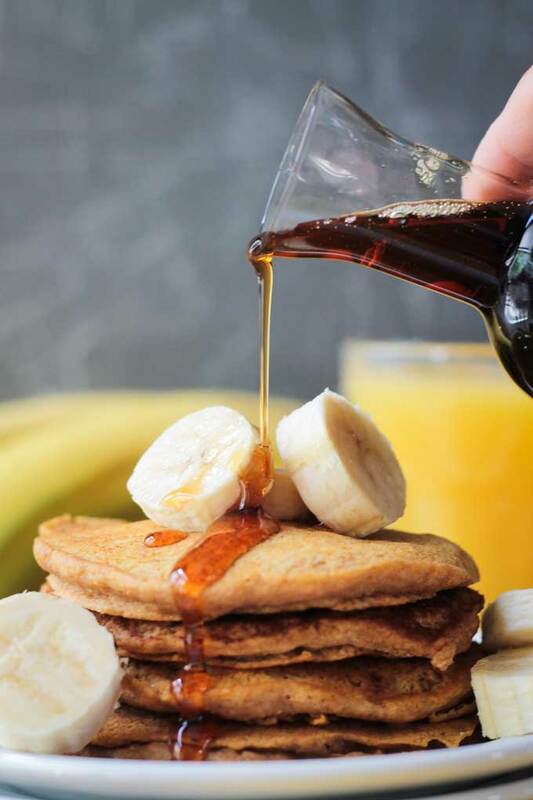 I almost instinctively broke my screen trying to grab that smoothie.I have some homemade pumpkin puree leftover so I’m definitely going to try this! Bahahaha! One day technology will allow us to send food through the internet. LOL! A girl can dream. Hope you love it! I’ve never tried pumpkin pie smoothie! Love the fall flavor, can’t wait to try. Fall flavors are some of the best! Thanks, Rika! Perfect! I hope you enjoy it! And congrats on your little one! 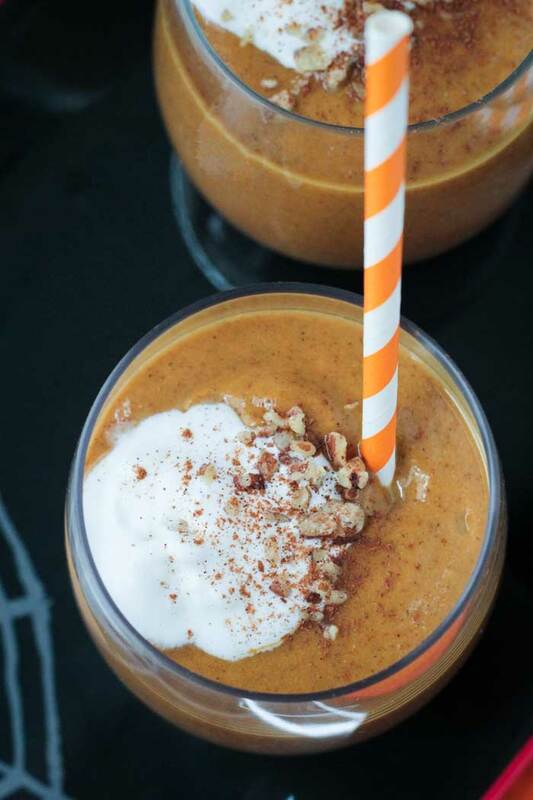 I love pumpkin pie smoothies—your addition of the pecans is perfect!!! I don’t know why, but pumpkins and pecans just go together perfectly. And the pecans make it so thick and creamy! This looks dreamy! Pumpkin pie in a glass is right up my alley. Especially, when it’s healthy. So much easier than baking a pie! Thanks, Melissa! I can’t wait to try this smoothie! Gimme everything pumpkin! #pumpkinallthethings Tis the season and I’m overloading on all of it. 🙂 Thanks, Amy! What a perfect way to celebrate pumpkin season here in Fort Lauderdale! All of the wonderful flavors of fall in a cool refreshing drink- I love it! Yes, refreshing, but with all the warm fall spices! Thanks, Sonali! This is a smoothie winner! I’m obsessed with pumpkin so this will be a sure favorite! This smoothie looks so good. Much healthier than those lattes everyone’s talking about! Oh, definitely. 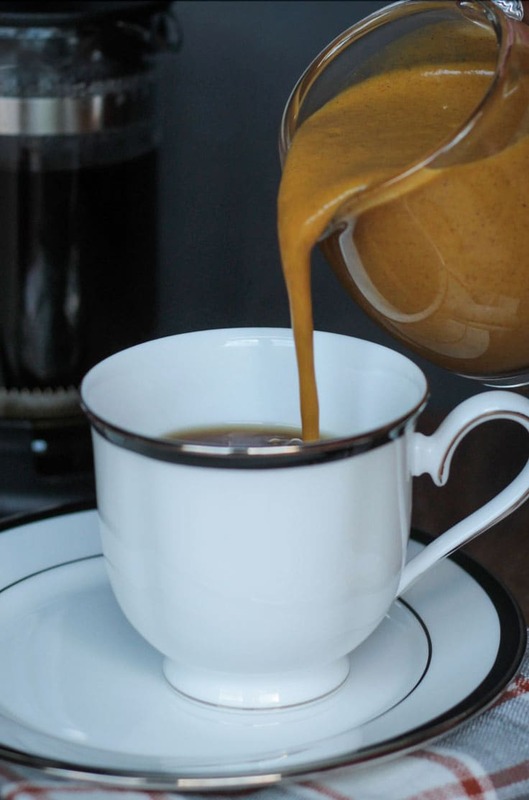 Though I do have a Pumpkin Spice Creamer recipe on the blog too! 🙂 Thanks, Dianne! I love pumpkin in smoothies, even when I don’t load up the pumpkin flavor! Right now, pumpkin pie everything sounds great to me!! I always go into pumpkin overload even before October starts! I need to start pacing myself. LOL! Yes, and much quicker too! 🙂 Thanks, Cadry! This is one of my favorite fall combos in a glass 🙂 Looks great! It’s so creamy and delicious! Thanks, Maria! Love the nuts in yours! So creative. Looks so delicious and I’m so ready for fall now. Gorgeous photos too! I always associate pumpkin and pecans together…not sure why…they just go so well I guess. Thanks, Julie! This makes me feel so excited about Autumn! It still doesn’t quite feel like it’s here yet but this recipe is giving me those Autumn-y feels. Sounds gorgeous. It finally cooled off here just today. It’s in the low 60’s and windy. Very fall! I have some friends who would likely knock you over to get to this!!! I just can’t do a ton of pumpkin, but I love the idea! I am so happy Thanksgiving is coming and I get to buy some pumpkin puree and make this smoothie. I know I’m going to want it everyday. We’ve already made it several times this season. It’s refreshing, yet still has those cozy fall spices. Best of both worlds! Thanks, Ginny! This sounds absolutely lovely! I have never thought about combining the pecans to a PS smoothie option, I bet that tastes fantastic! I love pumpkin and pecans together! Let me know if you try it. Thanks, Elizabeth! This looks so perfect for the warm start that fall is off to over here. It was still in the 80’s for us last week. Finally today, it’s low 60’s and feeling like fall should! Love it! Thanks, Becky! Those straws came from the dollar spot at Target! They had a bunch of colors about a month ago. Score! 🙂 Thanks, Laura! 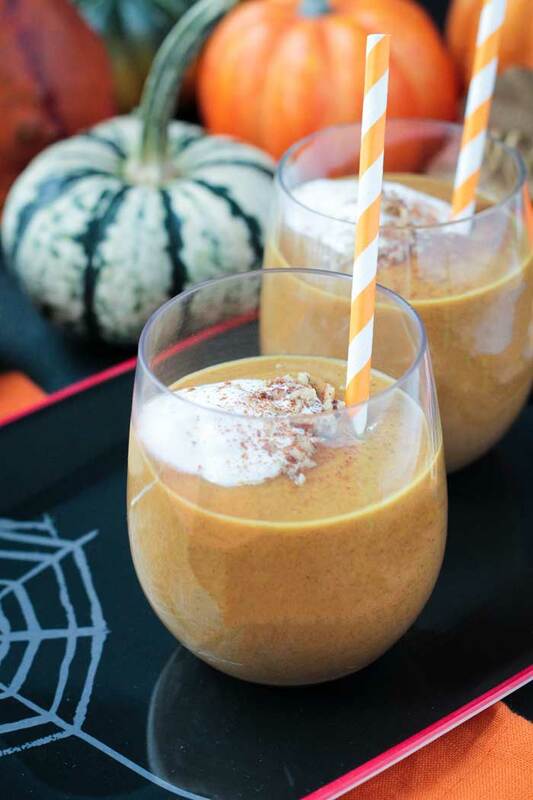 The pumpkin pie smoothie looks delish! Do you think I could substitute organic skim milk without changing the flavor much? Yes, for sure! They are interchangeable in any recipe. This looks AMAZING!!! Can’t wait to try it! !